Seekirchen is a city in the Flachgau area in Salzburg. It is situated by Lake Wallersee, the biggest lake in the Salzburg Lake District (Salzburger Seenland). Seekirchen was first mentioned in a document in 696, but was more or less a sleepy village until after WWII. Since then, it has developed into a bustling small town with a booming economy. Seekirchen is well-connected to Salzburg via roads and the railway; getting to the capital by train takes a bit more than 10 minutes. Seekirchen as a total population of approximately 10,000. 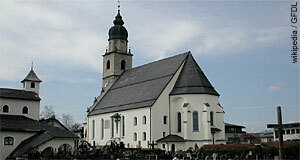 Together with its historic rival Neumarkt, Seekirchen was elevated to the rank of a city in 2000. In terms of sightseeing, Seekirchen has relatively little to offer. Note the Stiftskirche or Monastery Church. The monastery was none of an order, but a Collegiate one, meaning that it was inhabited by a group of priests that did not follow any particular rule (e.g. Benedictine). The historic town centre can be found around the church - here it is obvious that Seekirchen was a village until fairly recently, since genuinely old buildings are limited to non-existent. Walking from the city centre towards lake Wallersee, you will pass the Baroque castle of Seeburg ("Lake Castle"). The Seeburg was built by local landlords to rival the Uiberacker′s Sighartstein castle in Neumarkt on the other side of the lake. It is now home to cultural venues, some offices and a private university. There is also a restaurant in the Seeburg. The bay of Seekirchen is somewhat secluded from the rest of the lake, therefore particularly suitable for skating. During the summer, Seekirchen is popular among dinghy sailors, windsurfers and skite surfers. There is a good path around Seekirchen, which is well-suitable for mountain biking or hiking. Seekirchen is the first lakeside community that is accessible from Salzburg by train. However, we recommend to one stop further to the station called Wallersee, where you can walk to the shore within 5 minutes. Make sure you are on a regional train that stops here. You will find a public lido that is nicer than the one in Seekirchen and closer to the station. From Seekirchen station, you walk about 15 to 20 minutes to the Wallersee.